The Regina Hotel Association (RHA) is a not-for-profit, hotel industry organization that represents over 3,100 guest rooms in 23 hotels that employ over 1,400 people in the city. Laura Armitage was appointed as the chair of the RHA’s board of directors in late April 2018. She is the general manager of the DoubleTree by Hilton and has served 39 years in the hospitality and hotel industry. Armitage takes over from Ryan Urzada, managing director of the Travelodge Hotel and Convention Centre Regina, who served as chair from 2016 - 2018. Urzada will remain on the board assuming the position of past chair. IHG's very own Canadian Yola Marshall has been promoted at IHG’s head offices in Atlanta. Her new role is VP Commercial Mainstream and Upscale Franchise. Within this role she will promote the successful development and implementation of commercial strategies for franchise hotels with sales support of mainstream, upscale and extended stay hotels throughout the U.S. She will also oversee the management of sales delivery in strategic plans for hotels, owners and key management organizations in the franchise estate with responsibility for driving revenue through IHG’s channels. Also at IHG, Beata Cieplik is now regional vice-president Canada, Marketing, Commercial and Revenue Management. 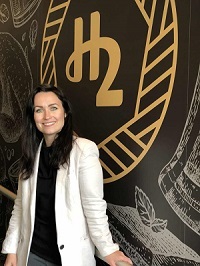 Previously, she was director of Commercial Delivery, Canada for IHG; and regional director of Sales and Marketing for Urgo Hotels (which included a number of Marriott, Hilton and Holiday Inn properties in Quebec, Newfoundland and upstate New York). She also previously worked for Marriott International as director of sales and marketing. Cieplik has a degree in Business Administration from the Université du Québec à Montréal and is a graduate of the Institute de tourisme et d'hôtellerie du Québec. Morbern, a leading North American designer and manufacturer of upholstery vinyl for commercial interior, marine and automotive markets, headquartered in Cornwall, Ontario, has announced that Chris Zappala has joined the company as the sales agent for the West Coast. Zappala will lead the company’s presence in California, Arizona, Utah, Nevada, Idaho, Oregon and Washington, and focus his efforts on the contract market, marine aftermarket and the automotive aftermarket.He officially joined the Morbern team March 23. Previously, Zappala spent nine years with Uniroyal Engineered Products, where he managed West Coast OEM and A&D accounts for coated fabrics. He also has experience in the kitchen and bath, and hospitality furnishings industries. 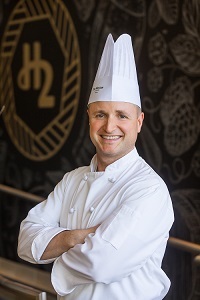 The Westin Bayshore is celebrating fresh beginnings this spring by welcoming two new members to its hospitality team: executive chef Geoff Carkner, manager of H Tasting Lounge, David Vo, and manager of H2 Rotisserie & Bar, Angelika Viehhauser. Most recently from Vancouver’s Pan Pacific Hotel, Geoff Carkner spent years gaining experience at five-star hotels in L.A., New York, and southwestern Australia. He says one of the greatest joys as executive chef is the opportunity to taste his staff’s creations and he looks forward to working with the talented cooks at the Westin Bayshore. In his new role, Carkner will oversee both H2 Rotisserie & Bar and H Tasting Lounge, as well as the in-room dining and catering for the hotel’s 70,000 sq. foot conference centre. A surfer, rock-climber and jiu-jitsu enthusiast, Carkner is known for also pushing boundaries in the kitchen. Among his many accolades, the father of two is especially proud of having been awarded the gold menu in 2003-2004 for banquet platters and gala dinners at the Grande Culinary Salon, as part of his membership in the BC Chefs’ Association. H Tasting Lounge is also excited to introduce new lounge general manager David Vo. 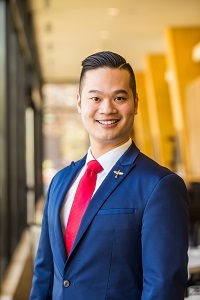 Vo worked his way up the hospitality ranks, working at Cactus Club Café, Earls and Joey, before becoming assistant food and beverage outlets manager at the Fairmont Waterfront. Most recently, he was the pre-opening restaurant manager at the flagship Honey Salt at JW Marriott Parq. Restaurant and Bar (in Calgary), the Jones Family Project Restaurant and Bar (in London, England), and more recently, Honey Salt Restaurant and Bar at the Parq Vancouver where she was general manager. Angelika is passionate about providing each guest with personalized service and memorable experiences that will inspire them to return.